"INHABITED SKY" – is a service, which the SKY-MAP.ORG authors provide in gratitude for the assistance in the site's development and design. By "inhabiting" a star, you obtain control of this star's page, on which you will be able to place your own personal or business information. Your information becomes directly related to one of the stars, you can edit as the contents of a pop-up window (visible when the mouse cursor points to stars), so the star's page that appears when you click on a star. All the information, which you place on the site "INHABITED SKY", must satisfy the rules, outlined in "Rules and conditions". If you have already had a star on INHABITED SKY, you can receive a photo of this star simply by using our system. There are no photos available for some areas of the sky though. To make sure that a star has nice photos, you can use the service "Astro Photo" . Our system allows you to put your star's photograph on either a MUG or a T-SHIRT. We hope the object with the star's image and a memorable inscription can serve as a unique and beautiful gift. "INHABITED SKY" and SKY-MAP.ORG are two different sites. Your "inhabited" star's page with your personal information will be located on the site "INHABITED SKY". The SKY-MAP.ORG site is a noncommercial popular science resource and the changes, made by you on the "INHABITED SKY" will not affect the information on SKY-MAP.ORG. Nevertheless, on the page of your adopted star on SKY-MAP.ORG you will see the special symbol which will be a link to the page with your personal information on "INHABITED SKY". 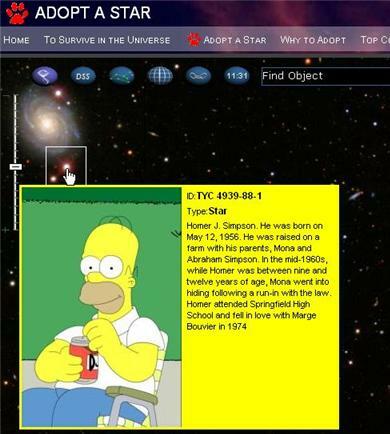 Thus, everyone who visits your inhabited star's page on SKY-MAP.ORG not only does immediately see that this star has been already adopted by someone, but also is able to instantly go to your personalized page on "INHABITED SKY".